Remember when IHOP decided it was a burger restaurant and was promptly roasted by the entire internet? You may feel a little nostalgic for those times now, but they were no joke. IHOb was an existential threat, and it seems that serving breakfast staples under a blue roof will never be enough for the chain again. Not long after releasing an IHOPS beer, IHOP has opened its first location with a full-service bar, which means you no longer have to be a coal miner or an Instagram influencer to drink booze with your pancakes. 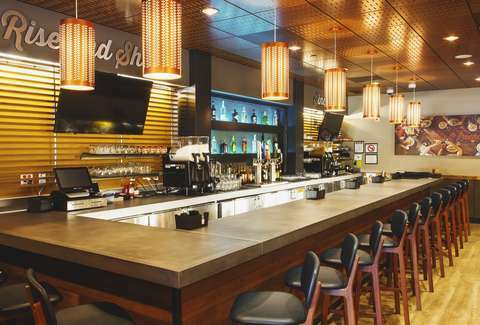 This passage to a brave new world opened in Phoenix, Arizona, and though a few airport locations serve alcohol, ABC 15 Arizona reports that this is the first IHOP with a full-service bar. Currently, there aren't plans to expand this nationally, but if it really takes off, who knows? Its "Rise & Shine" menu has craft beer, wine, and cocktails, which include the Mulemosa, with Regatta Ginger beer, sparkling wine, and a splash of orange juice; the Blue Roof Blood Mary, with Tajin rim, celery, olives, and hickory-smoked bacon; and the Frozen Rooty Rita, with blended margarita with strawberry puree. If you ask nicely, maybe they'll pour some rum into your syrup container. The idea came from the Romulus Restaurant Group, which owns several Arizona IHOP franchises, and President and COO Chris Sumners told the Phoenix Business Journal that they'd consider adding bars to their other Arizona locations if the response is positive. The location is open 24 hours, but booze is only available from 6pm to 10pm. Unfortunately, a 3am pancakes-and-whiskey nightcap isn't an option.